Have you ever considered hiring a personal trainer? If you’re looking to reach your fitness and body goals, having someone help you in the gym may seem like the answer to keeping you moving towards those goals at a faster pace than you could have possibly managed on your own. And this is true to a degree — having a trainer can be better than not having one. But have you considered your other options? Because you do have an option in the form of a specialized online coach and nutritionist! You see, an expert coach is someone who’s equipped to help you with each and every aspect of your transformation, not just immediate gym training… and this is where the benefits of an experienced, knowledgeable coach just begin! We’ll look at some of these wonderful benefits in just a little bit. We’ll categorize them neatly into a table for easy comparison with the benefits of having a personal trainer, for ease of reference. You’ll find the table below, but before you examine it, remember that we’re speaking of expert online coaches here. Let’s dissect the meaning of that term, first. Are extremely knowledgeable in the science of nutrition. Know how every macronutrient will affect your hormones. Understand how the secretion of each hormone will affect your body composition, and how to prompt the desired effect. Have solid and proven knowledge of the human body as well as how it responds to movement (aka kinesiology). Understand the means by which emotions and the mind are connected to the body, and therefore are clear on the involvement of emotional and mental state in body transformation. Have a proven track record of providing professional and effective services spanning many years, ideally over a decade. Have testimonials and before/after which confirm the above. Are always available for their clients’ needs as they understand the importance of prompt and accurate responses. Always, always make your well being a priority. *The best online coaches will have life coaching and/or psychology backgrounds to help their clients through any emotionally charged sticking points. As an expert coach who can easily put a check mark next to each of the above points (and then some), I can personally tell you that what I provide for my clients, no personal trainer ever could! 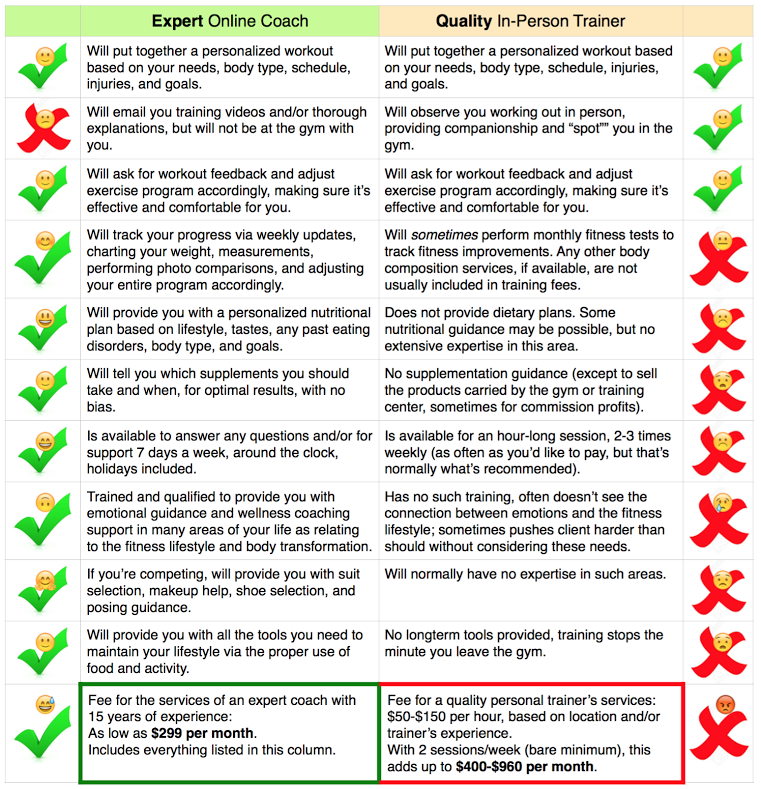 As you can plainly see from the chart above, going with a personal trainer isn’t always the best option — an online coach will often be the better choice. Knowledgeable, experienced remote coaches will provide you with every single variable in any equation involving fitness and physique transformation. This is exponentially more true when you are looking to compete; the vast majority of personal trainers do not have the expertise to guide a competitor through a successful show prep, where extensive knowledge of nutrition and your body’s hormonal response to it is absolutely essential. Of course, even if you’d only like to look like you could step on stage (or be on the cover of a fitness magazine), you’d still benefit from an in-depth, all inclusive program, over only the training component provided by a personal trainer. And if you’re the type of person who likes to know that there’s always someone on your side, to answer all your questions and address your concerns even at 10:00 PM on a Friday evening, an expert online coach is the clear winner there, too! If you are a complete newbie who’s feeling insecure about learning to perform new exercises on your own, hiring a personal trainer may be a great way to dive in and begin that introduction to the gym along with anything unfamiliar. If you have extensive injuries and do not trust your own ability to watch your form, a personal trainer may be the only way you can prevent injury. If you are a nutritionist who knows exactly how to manipulate your own food intake for optimal results, yet are bored with your workout or are lacking in fitness knowledge, a personal trainer may be just the ticket to mix things up. You simply want a gym buddy and a spotter. An online coach can’t do either for you. Over the years, I’ve worked with many people who’d suffered injuries at the hands of incompetent personal trainers — you always want to be confident that the trainer you choose is experienced and dependable. This does apply to online coaches, as well; possibly even more so. I’ve rehabilitated many hundreds of girls over the years who, in the hopes of saving a bit of cash, ended up falling prey to incompetent people and their cookie cutter programs. You always want to do thorough research on the person whom you’ll be entrusting your health and body; you never want to end up in the wrong hands. A competent, professional, knowledgeable personal trainer may be just what you need to get excited about being in the gym again. And an experienced nutritionist/remote coach can provide you with all of the tools you need for long-term body transformation success. This entry was posted in articles, Motivation, Training. Bookmark the permalink.